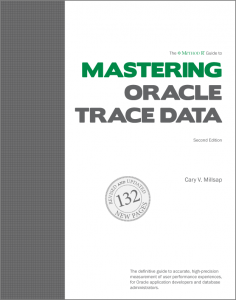 Cary Millsap’s The Method R Guide to Mastering Oracle Trace Data, 2nd edition contains everything you need to know about Oracle trace data—how to collect it and what to do with it once you have retrieved it, using the Method R Workbench software suite. The book creates a scientific basis for understanding why computing systems perform the way they do. It provides comprehensive detail about controlling, retrieving, and interpreting Oracle extended SQL trace data. It includes one hundred pages of worked examples of measuring and improving performance of Oracle systems. It concludes with a perspective, including opinions from dozens of Oracle professionals, on why so many people rely on Oracle trace data for the most demanding database applications on planet Earth. Cary shows you how to understand exactly what is happening in an Oracle system, which begins with measuring the right things. The most important thing he teaches is the repeatable process that ties it all together, that helps you make the right decisions. With this basic change, there is no longer any need for magic, or luck. With just a little work, we ourselves can be performance heroes.